So the challenge was set: Red Symonds. 774AM. Would he come paddling for the last day of our challenge? We’d like to think so, despite his luke cold reception to the idea when speaking on air with me this morning. So now the challenge is for everyone to ring in to 774AM in the morning and demand that Red get on board for the last leg of the challenge. No worries if he hasn’t paddled before: we’ll have Olympian Warwick Draper and pro kayaker and adventure racer, Jarad Kohler, on hand to give pointers on paddle technique. Back to today’s paddle and it started out a strange old day. The Neighbours crew was back at Parks Victoria’s Warrandyte State Park filming their finale for the year. It was an eye off between us and the stunt doubles: who’s gear was brightest and best? We left them in our wake dealing with actions and cuts while we just got stuck into the action. Plenty of pristine wilderness, despite being so close to suburban Melbourne. The rapids came and went, mostly taken the right way up. Plenty of remnant bush meant it was wildlife spotting time again – kangaroo, more platypus and plenty of birdlife. Further on and we were met by the North Warrandyte Landcare Group working hard to weed and revegetate sections of the riverbank on public land and on their own river frontage properties, fighting bridal creeper, morning glory and ivy smothering the natives. Ian Penrose from the Yarra Riverkeepers also turned out to say hello and explain his role in getting the health of the Yarra on the political agenda. Downstream, we wondered what a man bent over in the bushes was doing. A quick hello and it turns out we had just met, by chance, what others tell me is a legend in the world of river ecology and biology. Cam, a ranger working for Parks Victoria, toils on a riverbend regenerating a wetland area, restoring native sedges and, taking inspiration from building a small rock catchment to study and provide protection for spawning grayling away from the carp that have infested the river. Now that fish ladders have been put in place at places downstream where we have built an obstacle, Cam believes the endangered Grayling will breed again in the area and is seeing evidence of that (although, the fish ladders are only of use if the environmental flow in the river provides sufficient flow over them). This small stretch of river is also a favoured place for eels that eventually migrate as far as the coral sea. Never have any of us met a man with such passion, zeal and, importantly, head bursting with knowledge when it comes to the science of how a river, the land around it, the flora on it and the wildlife that depends on it, rely so delicately on each other. The energy in his showing us an Aboriginal eel trap – hundreds of years old – was infectious. We paddled off in wonder of people like Cam who we would certainly brand a Landcare Hero (maybe he should be a special guest on www.landcareheroes.com.au). [Sacha] Over the day, in fact, over the past few days, probably the strongest concern that is common amongst all the landcarers we meet, is that of native vegetation, or wildlife corridoors, along the river banks. Our history of clearing land right down to the riverside to maximise available land for agriculture and grazing has left its mark. While most people appreciate and value our farmers, biodiversity plantings along the river, when seen from the river, appear equally important – as biodiversity corridoors, wind breaks, and natural filtration for fun-off which helps water quality for all river users. It also becomes very clear, when observing from the river, that active revegetation with 20 or so mixed species may be essential where areas have been cleared long ago – in some areas nothing but wattle, which disperses easily on the water surface in great flotillas of yellow, grows. Although these native strips of vegetation along the river are not compulsory at the moment, we have been told there are strong incentives in place to encourage landowners to revegetate, and in the many areas we saw work had been done, we were inspired and commend those landowners / landcarers responsible. Today we also braved another tunnel. The S2S reconnaissance mission was led by our truly fearless adventure racer, in whom we have developed much faith when in toubled waters. A drop at the entrance to the tunnel was followed by 30 seconds…a minute…two..? of darkness except for a light at the end of the tunnel. At the back of the team for this one, I could barely hear voices over the roar of water echoing through the tunnel. In this case it was only the low flow that made the tunnel safe to travel through. And ok, it was fun. even the surprise double drop-off the other end. “KEEN Hybridlife is all about seeing people in the outdoors. During the past two days I have been paddling down the beautiful, very important Yarra River as part of the S2S Landcare paddle. I have seen many people living their ‘Hybridlife’ – Playing, Caring and Creating in the outdoors. Play: I have seen school groups enjoying grade two rapids, joggers and cyclists using the many Yarra trails, and all types of people simply looking at the beautiful Yarra River. It’s been great seeing all the different recreational groups using the Yarra River and is surrounding banks. 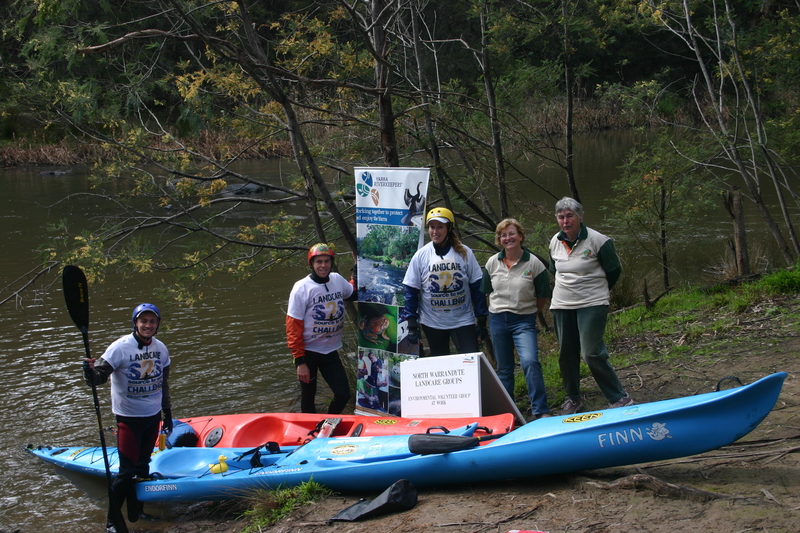 Care: I have been lucky enough to be paddling down the Yarra with Landcare experts Chris and Sacha. I have also met Ian Penrose from Riverkeepers and the enthusiastic/very knowledgeable Cam from Parks Victoria, and many other volunteers. They all have a strong connection with the Yarra River and are doing everything in their power to enable the Yarra River to stay healthy. Create: I have observed Platypuses, Wedge-tailed Eagles and stretches of river only accessible by kayak. The Yarra is truly inspirational! So, inspirational that the famous TV show Neighbours have just finished filming their dramatic raft capsizes for their final episode of this current series. Everyone, I have meet on the river has had a certain glow about them…they are passionate and enjoying life. They have all be living what we call a Hybridlife. KEEN hopes many other people in the future can – Play, Care and Create – throughout the Yarra River and its banks. This is why KEEN supports such a great event like the Landcare S2S Challenge.